On February 18, 1901 John W. Condit and his wife, Caroline, sold the 100-foot square property at the northeast corner of Sixth Avenue and 58th Street to the Mela Realty Company. It sat directly behind the hulking New York Athletic Club on 59th Street (on the stretch later known as Central Park West) and a block west of Cornelius Vanderbilt’s massive chateau on Fifth Avenue. Mela Realty purchased the corner with the intention of erecting a high-class, modern apartment building. To back the aggressive project, it took a $300,000 from William H. Burgess on the same day the title was transferred. Architect Harry S. Clawson received the commission to design what would be called The Coronet at No. 57 West 58th Street. The Beaux-Arts style structure was completed in 1902, a 10-story brick and stone confection gushing with lacy balconies, carved lions’ heads and heavy scrolled brackets. Residents entered through a large two-story arched opening with free-standing columns and a cartouche with a carved coronet. A stone parapet crowned the roofline. A carved cartouche surrounded by wheat contains a coronet. The balcony directly above once held an ornate iron railing. Modern conveniences included five hydraulic elevators. 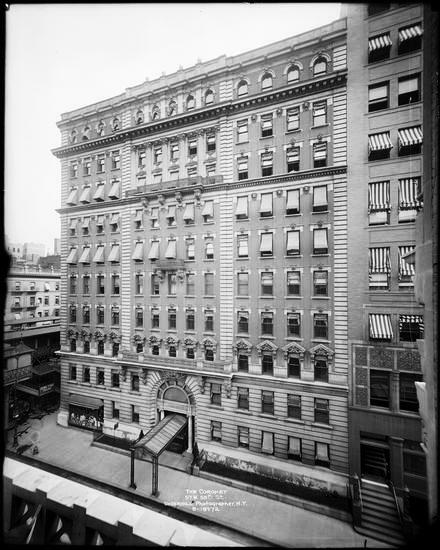 Extra income came from upscale shops along the sidewalk, and the New York Athletic Club which took two full floors as additional sleeping rooms for its members in October 1902. The Club spent a staggering $10,012 to furnish and decorate the apartments—around $285,000 in 2015. Five months earlier the Mela Realty Company announced that its offices would be moved into the new building. Lace-like ironwork and robust pediments adorned the facade. 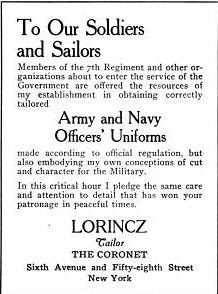 The Coronet filled with well-to-do residents, including several from the medical profession. Nonetheless, the Mela Realty Company was unable to meet its mortgage payment. On April 2, 1903, less than a year after the doors opened, William Burgess and his wife, Cora, sued and won the building in foreclosure. In 1905 two of the street level shops on the 58th Street side were Thomas Young’s floral shop and Albert Papa’s fruit store. Although the Coronet had its own “private electric plant" below ground, it also depended on gas for lighting when the electricity failed. In the basement the gas lines traveled through two meters, just under the entrance stairs. On October 13 something went terribly wrong. That afternoon a tremendous explosion blew away the stone steps. The force of the blast knocked Henry J. Morton, a private detective walking by, off his feet. He jumped to his feet and ran to send in a fire alarm. A few months later dentist Morris I. Schamberg moved into the building from Philadelphia. He specialized in “oral surgery, including X-ray work and extraction under anesthetics.” Among other residents in the medical profession here were renowned surgeon Walter Arthur Bastedo, Dr. Frank C. Lewis (who was also managing editor of the International Journal of Surgery), and dentist Stephen O. Storck. Beginning in 1906 the New York Athletic Club considered buying the Coronet as an annex to its Central Park South clubhouse. On May 10 that year The Evening World reported that the club “now the largest of the kind in the world,” needed additional space and was eyeing the Coronet. The building was valued at $1 million at the time. The debate among members and even negotiations with William Burgess would go on for years. Hearing the body fall to the pavement, the Coronet’s engineer, Charles Halloweg, and his assistant, George Walsh, rush to the scene; quickly joined by superintendent Julian J. Pettigrew. A few seconds later, the dead woman’s nurse, Ann Driscol, arrived and identified her as Mrs. William H. Hamilton. Coroner Harburger left the two women, telling them he would get the information on the husband if he had to subpoena everyone involved. A reporter from The Times who arrived later asked Pettigrew about Mr. Hamilton and he, too, got vague answers. Convinced that information was being withheld, Coroner Harburger refused to issue a permit for the burial of the body until all the facts were revealed. It wasn’t long before Maurice Eller arrived at the undertaker’s establishment and identified his wife’s sister, Annette de la Barre. When millionaire John Philbrick Laflin died on February 24, 1903, his widow and daughter, both named Ellen, were staying at the Hotel Savoy. The family’s summer estate “Bell Haven” was in Greenwich, Connecticut. By the time of the younger Ellen’s introduction to society, they had moved into the Coronet. On December 29, 1911 The New York Times reported on the dance Ellen Laflin gave at the St. Regis Hotel for her debutante daughter. She was no doubt elated when her entertainment got first billing in the newspaper’s society headlines that morning. Dr. Stephen Storck and his family were still in their eighth floor apartment in 1913. At only 35 years old, Storck was highly successful. He and his wife had two young sons. Tragedy befell the couple in the early hours of June 5 that year. The evening before they had entertained a married couple and the four played bridge until about midnight. An hour and a half after their guests left, Mrs. Storck assumed her husband was asleep when she heard a terrifying shriek. The Sun reported “His wife heard him scream as he went down, and looking out, saw his body on the pavement below.” The dentist was instantly killed and his death could not be determined as to whether it was accidental or suicide. Dr. Walter A. Bastedo was living here at the time. A specialist in abdominal diseases, he was associated with St. Luke’s Hospital and taught pharmacology at Columbia Medical School. When Booker T. Washington became seriously ill in 1915, Bastedo was consulted. He diagnosed the educator with serious kidney trouble and blood pressure of 215. On November 4, 1915 Dr. Bastedo personally brought Dr. Washington to St. Luke’s Hospital for treatment. Unfortunately, it was too late. Booker T. Washington died 10 days later. Upscale tenants like Margaret Auchmuty Mackay and Annie Emily Claiborne Pell were in the Coronet at the time. Annie was the widow of the wealthy Clarence Pell and her cottage on Rhode Island Avenue was well known among the fashionable Newport set. Her father, Colonel Claiborne, was a member of Congress and she was descended from William G. C. Claiborne, the first Secretary of the State of Virginia. And the building continued to house an inordinate number of physicians. In 1919 Dr. Edward Bronson Finch, Dr. James Herbert Lawson and Dr. Frank Waldo Hempstone all listed their addresses here. Already in the building were Dr. James H. Kenyon, Dr. Herbert L. Wheeler and his Yale-educated son Dr. Clifford S. Wheeler. Following the Armistice, now-Captain Wheeler testified to the peace conference in Paris as to conditions in Siberia. He was home in time for the December 1, 1919 announcement of his engagement to Dorothy Jeannette Lewis at a dinner dance in her parents’ Springfield, Massachusetts home. 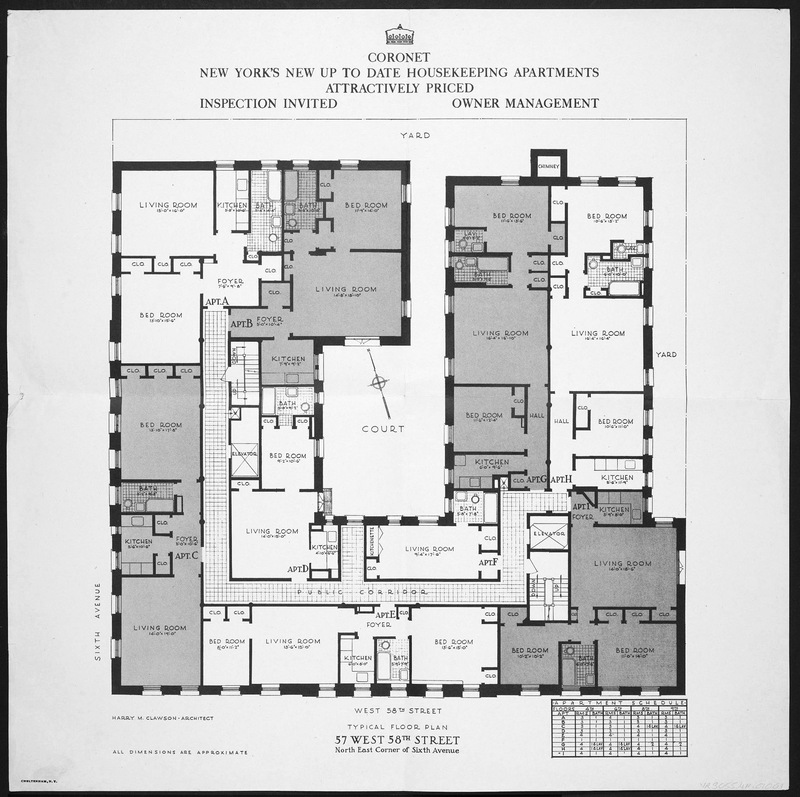 Alterations would have to wait until leases expired and in 1920 residents were still advertising to sublet their apartments as they left for Europe or summer resorts. On April 25, 1920 an advertisement in the New-York Tribune offered “Seven rooms, 3 baths; beautifully furnished.” And later that year an ad appeared for a “comfortably furnished housekeeping apartment” of “8 rooms, 3 baths, $600 monthly” for eight months. The Coronet continued to house well-to-do and celebrated residents throughout the first half of the century. In the fall of 1925 internationally-renowned flutist George Barrere moved in, possibly because of proximity to Carnegie Hall. But the second half of the century was not so kind. Modern apartment buildings lured affluent renters, and reduced income contributed to the building’s decline. At some point the three upper cornices were sheared off, the parapet removed, and the balconies below the two-story engaged columns on both sides were lost. Long, blank scars and ornate brackets with nothing to support testify to the missing balconies and cornices. In 1976 the building was converted to an 85-apartment condominium. The renovation included a distracting upper floor with a slanted skylight visible from the street. Despite changes inside, the building retained its name, The Coronet. In 1985 The Manhattan Ocean Club opened in the building, a result of the rebirth of the area now filling with trendy and upscale eateries. The restaurant hired chef Steve Mellina, who studied at the Cordon Bleu in Paris. Considered one of the best fish restaurants in Manhattan, patrons were prepared to spend a minimum of $125 in the room lined with Picasso reproductions. The Manhattan Ocean Club was in the Coronet for two decades, closing in 2006. It was replaced by Quality Meats Restaurant. A mishmash of garish commercial awnings and an unsightly fire escape detract from what remains of the 1901 design. Today the somewhat careworn Coronet apartment building is little noticed by passersby. But a pause to look up reveals the remnants of Harry Clawson’s 1901 beauty. Unfortunate architectural barbarism. It would not take much to restore this beauty to its former glory but the owners obviously dont care.